Internal medicine or general medicine (in Commonwealth nations) is the medical specialty dealing with the prevention, diagnosis, and treatment of adult diseases. Internists often have sub-specialty interests in diseases affecting particular organs or organ systems. 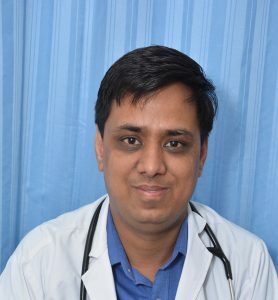 Dr Sumit Jain has completed his MBBS from B.J.M.C Pune & MD Medicine from MGM Medical College, Indore. Dr Sumit Jain expertise in the field of medicine. He has more than 9 years of experience in the field of medicine department. Now, he is working as Senior Consultant in JP Super Specialty Hospital.